Got huge bunch of fresh curry leaves from the neighbour’s garden as they have trimmed the huge tree! What to do with it was the question? The best option – to make curry leaves chutney. It is popularly knonw as ‘karuveppilai chutney’ in South India and savoured with idli, dosas etc. 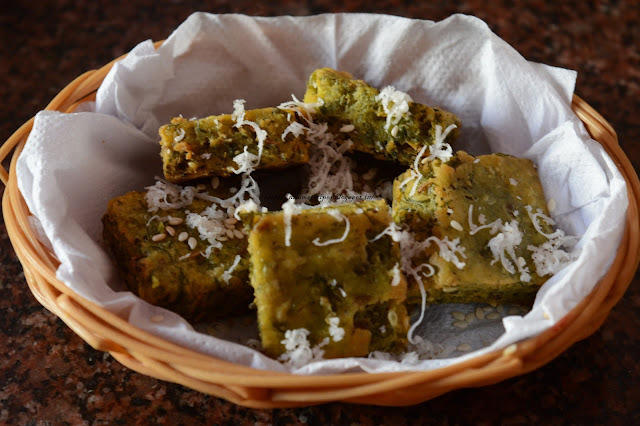 You may also have it with our Indian snacks like bhajji etc. This diabetic-friendly kadi patta chutney recipe is an excellent food for shiny and healthy hair. Fresh curry leaves, coriander leaves and grated fresh coconut are the basic ingredients to make this chutney. The time consumed to make curry leaves chutney is also minimal. You may also store this chutney for 5-7 days in fridge! Learn how to make curry leaves chutney here! 9) Pinch of hing (asafoetida). Heat oil in pan add mustard seeds, cumin seeds and urad dal and saute it on medium low heat. Once the dal turns brown, add green chillies with hing and saute for a minute. Remove from heat and take into a plate. Add little oil in a pan , curry leaves, grated fresh coconut and saute for 1 minute. Then turn off the heat. Transfer the mixture in mixer grinder. All add the tamarind and jaggery pulp into it. Add salt and little water and grind to a fine paste. You can serve with bhajji. 2) Heat oil in pan add mustard seeds, cumin seeds and urad dal and saute it on medium low heat. 3) Once the dal turns brown, add green chillies with hing and saute for a minutes. Add little oil in a pan add curry leaves, grated fresh coconut and saute for 1 minute. Then turn off the heat. 4) Remove from heat and take into a plate. 5) Transfer the mixture in mixer grinder. All add the tamarind and jaggery pulp into it. Add salt and little water and grind to a fine paste. 6) You can serve with bhajji.